Dang It Delicious: Dragon Fruit is the prettiest fruit, ever! My youngest Mark, age 5, has a fruit-tooth, like a sweet-tooth, but "fruit-tooth." The fruit-love started at Costco (out of all places) one day years ago. Costco had sample tables filled with so many fruits - pluots, plums, prunes, persimmon, pears. Then and there we started the Costco Food Word List. Then we hit Albertson's produce section to continue the vocab sessions. Next step to the ambience of Asian markets in SLC. 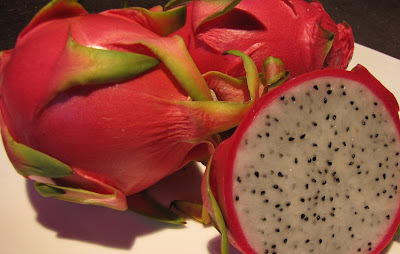 We agree, hands down, that the prettiest fruit with the coolest name is the DRAGON FRUIT. Hot pink, black and white, and cloyingly sugary when way too ripe, Dragon Fruit (aka pitaya or thanh long), is beautiful. It is in season now, so I serve it with watermelon, grapes and strawberries to the kids. 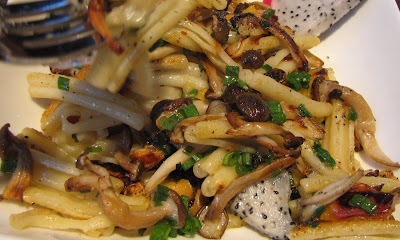 It tastes like kiwi with similar sesame-looking black seeds (rich in vitamins). Fantastic to stare at. Pasta. What to do with left-over pasta tonight? I love sweet fruity chunks added to a spicy substantial dish, like pasta, with other flavors kicking in, like peppers, garlic, onion, and mushroom. Interesting, suprisingly happy combo. 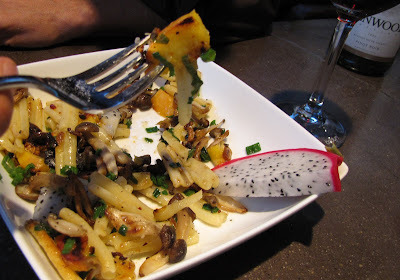 Let's do what's conveniently around: dragon fruit, peach, mushroom, garlic, scallion. First heat, on high, the pan and wait for the olive oil to be HOT and for the oil to coat the pan. 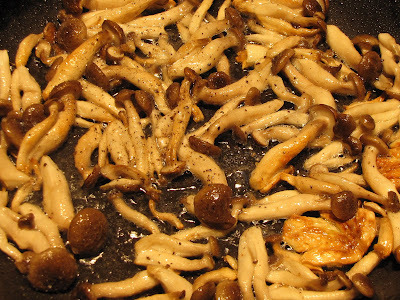 Add mushrooms and garlic. Add salt and pepper after they brown. Then add cooked pasta. I am a fan of crunchy searing...so let the pasta cook in the high heat, get brown a little (resist moving it too much). Throw in some slices of peach. Salt, pepper and a some crushed red peppers for kick. 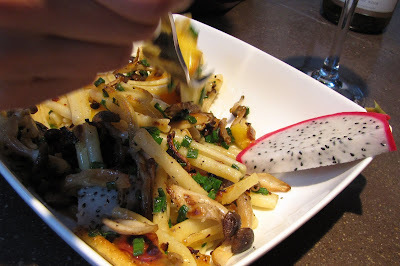 When the peaches caramelize a bit, toss in high heat and add cut dragon fruit and scallion. It's all about timing and the order of what to toss into that heat!